Registration is now closed for our October 2019 event. Thank you for your tremendous interest in this great event! 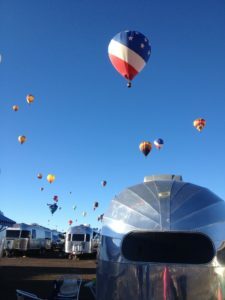 Each October the skies of Albuquerque are filled with hundreds of colorful hot air balloons while shiny silver trailers sparkle below them. 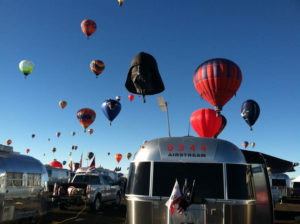 The Balloon Fiesta National Rally provides Airstreamers a front row seat to the world’s largest ballooning event. The rally takes place over the first weekend of the 9 day event. You can sip coffee at sunrise outside of your Airstream or admire a glorious sunset while balloons fly directly overhead – all in the comfort of your traveling home. Watch scenes from last year. Do you have some great pictures of the Balloon Fiesta National Rally? Send them to us – BalloonFiestaRally@hotmail.com And we will post them!